Tomorrow we welcome Spring (with open arms!). I am so happy to say goodbye to winter. To celebrate the changing of the seasons I wanted something sunshiny and cheery. These were my inspiration ingredients. Truth be told I have had a mad lemon craving for awhile now and decided lemon cupcakes would help satisfy that craving. Boy was I right. 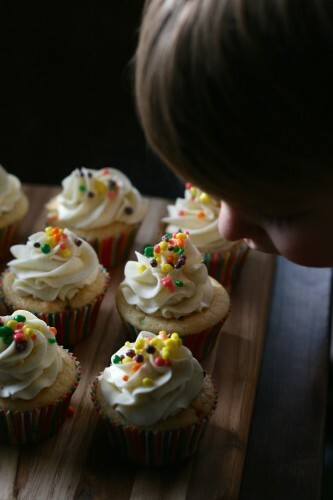 If you are looking for a truly tart lemony lemon cupcake look no further. I did not mess around when making these. There is an entire cup of fresh squeezed lemon juice in the batter. Please oh please do not use that lemon concentrate stuff in the green bottle or the plastic lemon you see at the store. 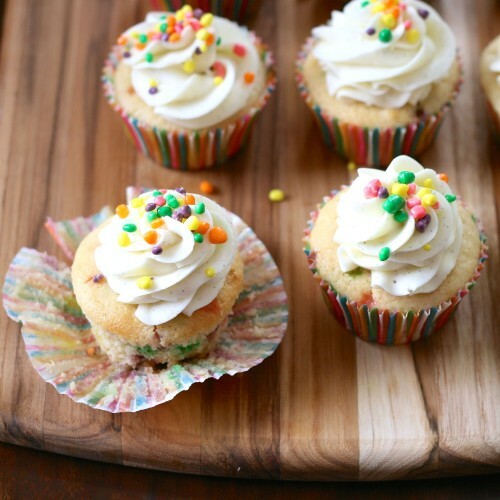 Use the real stuff for these cupcakes. They are special. 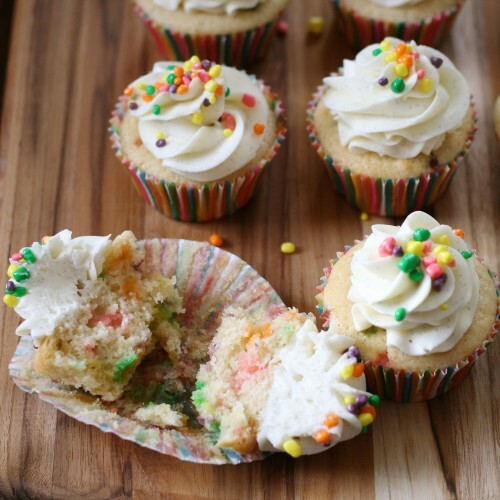 I took a sort of Funfetti turn with these lemon cupcakes and tossed in some Nerds candies. 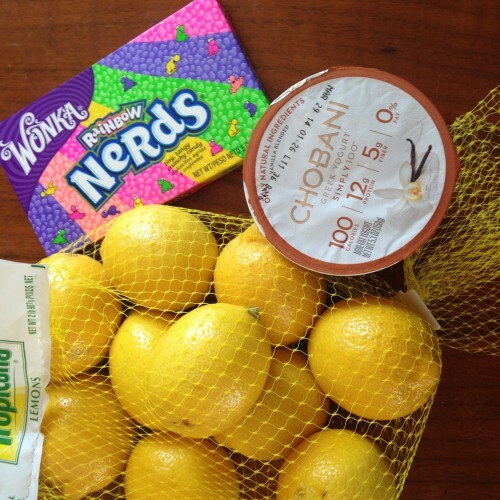 Those sweet and tangy little candies worked so well with the tart lemon. However I will say that some of them did settle to the bottom which caused the bottom of the cupcakes to be a wee bit sticky. Not a total deal breaker in my book but if sticky bottoms are something you want to avoid just leave the Nerds out. Preheat oven to 350 degrees F. Place cupcake liners in a 24 count pan. In a mixing bowl combine all the ingredients BESIDES the Nerds. Mix together until combined. Gently fold in Nerds careful not to over mix because they will start to lose their color. Spoon batter into prepare cupcake pan. Filling 3/4 the way full. Bake for 18-20 minutes or until a tester comes out clean. Remove from oven and allow to cool at least one hour before frosting. Using your stand mixer beat the butter on medium high for about 8 minutes. You will notice the butter becoming pale and creamy. Turn down the mixer to the lowest setting and mix in remaining ingredients. Mix for about 1 minute. Bump up the speed to medium/medium high and mix for 6 minutes until fluffy. 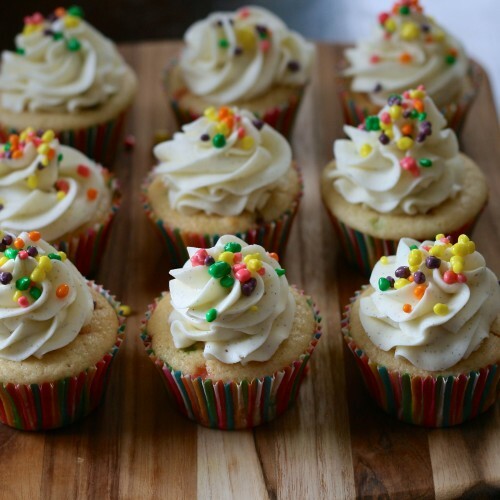 I frosted the cupcakes using my favorite 1M tip and sprinkled them with extra Nerds. You’re welcome! That frosting is so fantastic! Nerds Cupcakes!?!? Oh my lucky stars!!! Why have I never done this?? Nerds are possibly one of my all time favorite childhood candies…I do admit I still sneak the little boxes my children bring home from parties to this day! I love this idea 🙂 Hope you have a great rest of the week and a fabulous weekend coming up! Jamie, my husband is a nerd… fanatic!! He would absolutely beg me to make these… so I will! Thank you for sharing with all of us at the Show Stopper party the other day! Pinning onto a few boards! Nerds lovers unite! I hope you enjoy them. I’ve been craving lemon lately too. I think it’s a spring thing for sure! In NY we have been lucky enough (where I live) to have missed snow almost all winter long! However, I’d still bake cupcakes, warm or cold 🙂 I really love that you made these super lemon-y! My wife owes me baked goods of my choice so I will have her make these :-). They look delicious! That sounds like a pretty good deal to me! 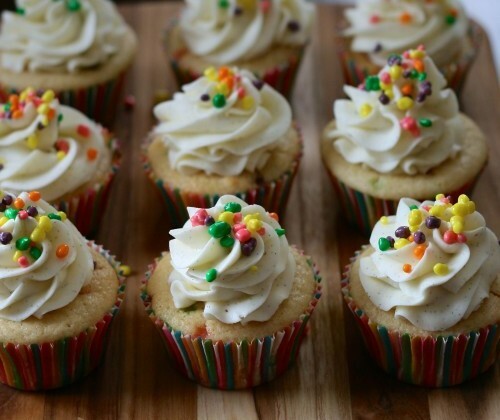 These cupcakes are gorgeously decorated and would be great at a party! The Nerds make the so fun and colorful!